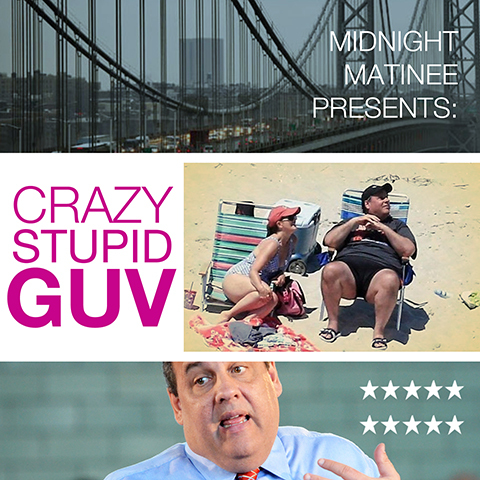 Midnight Matinee presents a rom-com about everyone's favorite New Jersey Governor Chris Christie - Crazy, Stupid Guv. Watch as he mis-appropriates money, closes a bridge for spite, cancels a popular transit project, and maybe, just maybe, wins your heart. On WFMU, streaming on your internet, and then archived for future generations. Good Morrow Rich. This fantastic. This song's by a fellow out in California named Ark U. Kidden. Really, that's his name. does his mother's sister walk around saying "I Aunt Kidden"? His first sentence... “Ark U. Kidden, me”. I don't know what the U stands for... have to ask him one day. This sound piece is by frequent Midnight Matinee contributor Jack Spillum. Enjoy. John Cusack and a lot of pillows... Ulysses, I bet you're correct Rich. I was gonna say Ulysses or Umberto. What is the construction project that Christie is talking about? I'm writing him now; I hope I have a definitive answer before the show's out. This was the train tunnel expansion, right when he first became governor. He cancelled the project, but kept the money. True story. Schnall: Where was the train connecting? I think it was to give more tunnels for Amtrak to connect NJ and NY. The Federal government had put a lot of money into it already, but he cancelled the project. So they asked for the money back, but instead he used that money to balance the budget and make himself look good. That's all I know for sure. they're a little bit south of trenton, right? I think you're thinking of Destopia and Dostopia. Seriously, is someone calling me??? So, if Salutatorian is the second to the Valedictorian, does that make Vincent Price the Valedictorian? i'm not sure, but an anagram of vincent price is nice tv prince. well, there are westinghouse cufflinks... so why not turbans? i wonder if they ever made an orgone accumulator. thanks for the matinee, john. thanks for the show, rich. excellent as usual. sleeptime. kokotob? when was this released and is it a cd?